Whether you’ve been a ticket broker for 30 years or just started, there’s software (don’t let this word scare you) that can help streamline your operations, enhance your metrics, and ultimately, make you more money. If you’re a novice ticket broker you’ll want to read this from the start, if you’re well versed with Point of Sales (POS), but not much else, start at the 2nd section and if you’re a pro, you’ll probably want to go straight to the 3rd topic (real time software). Note: This blog post is not about how ticket brokers get their tickets or specifically how to become a ticket broker, but about helping potential ticket brokers, or existing brokers better understand the software which is available to them. With that said, if you are trying to better understand how the secondary ticket industry works, and or are thinking about becoming a ticket broker, the following overview will be very informative. Not all ticket brokers use a Point Of Sale (POS) but I couldn’t imagine having hundreds or thousands of ticket listings and trying to manage it with a google doc or excel file. That’s the whole point of a POS, to help you manage your inventory, which can get very difficult if you are more than one person. There are “ticket brokers” that only list their tickets on Stubhub, and in that case, maybe a POS isn’t necessary. But if you are getting serious about becoming a ticket broker than you should know that Stubhub doesn’t even account for 50% of all secondary ticket sales. So why wouldn’t you broadcast your tickets to more secondary ticket marketplaces? When trying to decide which POS to choose, I won’t pick favorites, instead I’ll state the facts. Ticket Network, is by far the most used POS. Many brokers complain about Ticket Network because they have strict rules; but for the most part these rules are easy to understand and are most often logical. Despite the few negatives, Ticket Network is the most used POS and has the most advance technology to date. Lastly, Ticket Network recently changed their pricing to better accommodate smaller brokers, and I have heard rates as low as $500 for the year (verse the normal $2,000k). Ticket Technology is the second most used POS, which was bought by Stubhub around 2006. For large ticket sellers that are focused on Stubhub, Ticket Technology does the job. But from my understanding this product has been somewhat neglected. For example, at Ticket trade shows Ticket Technology no longer has a booth to entice new brokers to sign-up and last I checked they weren’t even accepting new brokers on to their platform. With some 300+ brokers, Ticket Technology isn’t going anywhere anytime soon, but I question how dedicated Stubhub is going to be to ticket broker software in the future. Ticket Utils is the latest POS to hit the block. Released in early 2014, Ticket Utils Point of Sale has quickly become a major player in the point of sale market. Their concentration on providing wide inventory distribution and time saving automation has helped them bring in hundreds of brokers in a short period of time. Ticket Utils’ system is integrated with StubHub, Vivid Seats, Ticket Master Plus, Ticket Network, TickPick and eBay. The software is cloud based and has a simple intuitive design that is easy to use. It also comes complete with a built in Auto-Uploader that sends to all the industry’s top resale sites, built in AutoHold for double sale protection, a dedicated mobile version, and a QuickBooks integration. They have found success providing a one-stop shop at a reasonable price. Ticket Evolution was the newest Point of Sale to hit the industry a couple years ago. Ticket Evo, was created by 50+ large ticket brokers who’s mission was to make a better system that would take business and power away from Ticket Network. Ticket Evolution raised over a million dollars from ticket brokers and started developing a POS, as well as other software for ticket brokers. This started in 2009. My understanding is that the POS is live, although in beta(ish) mode. Other tools and features that they created such as a their ticket auto-uploader and Evopayment solution have been around for a while and have been well adopted. I do credit Ticket Evolution in helping propel the secondary ticket industry forward, specifically by helping ticket brokers adopt newer technologies. Besides cost, technology and functionality, there are other factors that lead ticket brokers to chose one system over another, we address that at the end of this blog. If you have been a ticket broker for more than five years than you know how difficult, or cumbersome it was to get your tickets listed on the top 10 to 20 most visited ticket sites. If you were using Ticket Network, you would export your ticket inventory file to a CSV file. You would than have to take that CSV file and upload it manually or via FTP (file transfer protocol) to all of the sites you wanted your tickets listed on. Depending on the size and amount of sales you did, you would do this every hour or so. Ticket Utils and Ticket Evolution created a Ticket Auto Uploader, which automated this process. This ticket broker software monitors a folder on your computer, and anytime there’s a change to your ticket inventory file, it automatically uploads the newest inventory file to all of the ticket marketplaces that you set up. Meaning if your tickets sold on Stubhub, once you reflect this in your POS, your file would change and those tickets would than get removed from TickPick and the other Ticket Marketplaces, thus helping you prevent “Double Sales”. This is a massive upgrade, however, the time delay on this system is roughly 15 minutes, so double sales still happen more frequently than one would guess. If you are large seller and not listing your tickets on TickPick, the fastest growing ticket marketplace, submit your Ticket Broker / Large Seller info here and we’ll have you set up in no time. Cloakify – Keeps all of your inventory up-to-date across all ticket portals in both directions. It constantly monitors your point of sale inventory and updates any changes across all portals. It monitors all portals for pending sales. Any sale has the corresponding inventory placed on hold, the order is marked as processing on the portal, and that inventory is immediately removed from all other portals. 1ticket – In addition to keeping your inventory in sync across all marketplaces, including TickPick, 1ticket can download all of your PDFs, create purchase orders, and post tickets for instant download on both StubHub and Ticketnetwork. Cost $150 a month. 24/7 Broker – 24/7 Broker is a flexible inventory management system designed to save time, enhance productivity, and increase your bottom line. They are broker owned and operated with 10 years of experience with ticket broker software development. Their software is compatible with three POS systems and seventeen ticket marketplaces. They assist brokers with uploading, reserving, and order completion. There are flexible rule sets that govern these three processes, which gives brokers an unbelievable amount of customization. “We know every company doesn’t operate the same and that is why flexibility and reliability are the foundation of our service.” Cost $299 a month. Autoprocessor (aka DTR) – A high end customized ticket broker software solution developed by brokers who’ve been in the business for 30 years. Autoprocessor says it’s perfect for both big and small brokers because it automatically invoices, confirms and delivers orders. They also have unlimited flexibility on who, what, and how you list your tickets to all the other marketplaces. At the latest Ticket Summit, TicketAttendant quietly released a new service / product similar to Dreamtix (see details below). If you are interested in finding out more feel free to email us or reach out to them directly. Cloakify vs 1Ticket – Interestingly enough, I believe it may make sense to utilize both services, but as I write this article that’s changing. That’s because 1Ticket’s primary focus was on the downloading of tickets and managing PDFs, while Cloakify’s focus has been on the automation side. However, both companies are now offering both features and it’s debatable if both services are necessary. At each company there’s one main point person, I suggest giving them both a call and deciding for yourself. The good news is, you can’t go wrong. Radar – Radar is the latest broker software to hit the scene. It was developed in house by a small ticket brokerage (in terms of people), however, a very large operation in terms of scale. Over the last two years they have developed software to streamline every single process; and to be honest, it’s good. How good? Well here’s some feedback: “After implementing Radar, our company reduced hours of manual shipping by 125 hours per week, making it possible for shippers to spend more time on research and other more important tasks.” Note, currently Radar is available for Ticket Technology and Ticket Network POS users. Are your tickets listed on TickPick? No Fees, No Chargebacks. No Hassle. After going to a recent ticket conference in Washington D.C. (in January 2014 held by a ‘ticket broker’) I struggle to put into words what I learnt and describe what ticket brokers may look like in 5 years. Unlike the usual NATB or Ticket Summit conference, which has an average age in the 40’s, the average age at this conference is roughly 30. This conference was all about partnering up and creating a new network of brokers. This concept isn’t new, Ticket Network, Ticket Evolution and the NATB all had / have similar missions. But something here seemed different. Email me at brett at tickpick for more info or an intro. Part of the attraction of Ticket Network, is not just the software, but the broker board that you are able to access. When you are on Ticket Network’s POS you are able to access and see all of the other ticket brokers’ inventory. So if you are broker that does a lot of business over the phone or just by email, you are able to access and sell other brokers tickets at wholesale prices. Additionally, if you are a new ticket broker, and you are interested in having a website, Ticket Network provides a white labelled solution so that you can easily have your own ticket website. Many brokers and newbies are attracted to this feature which I understand. But unless you’re a marketing guru, I wouldn’t advise you to spend much time and money on a ticket website. Instead, if you are trying to become a ticket broker, I would focus on the ticket inventory side of the business. I say this because there are well over thousand ticket broker websites that are all the same and powered by Ticket Network’s white label solution. It’s good and get’s the job done, but if you think that you can turn a website on and start driving meaningful traffic, you will quickly find out how challenging it really is. On that note, Rocket Poster also known as Ticket Utils, originally got started by creating software to help ticket brokers automatically list their tickets on Ebay. Since then they have created ticket broker software such as their own Auto-Uploader. 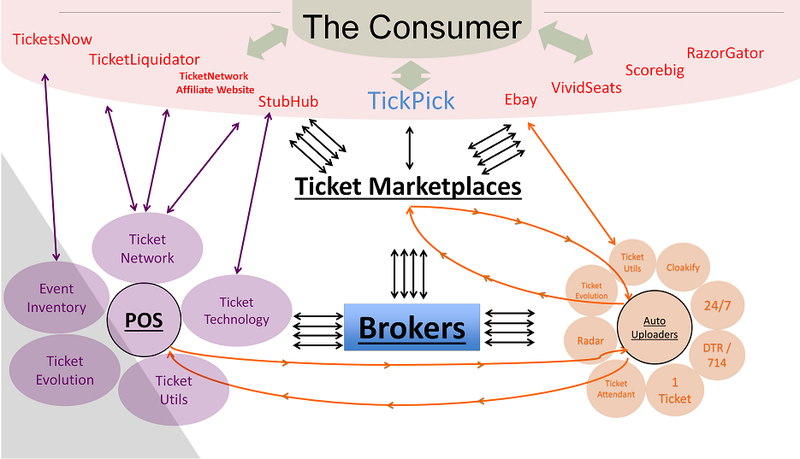 Ticket Utils latest focus is building interactive seating charts and 3d maps to power ticket broker websites and ticket marketplace websites. So if you are debating about creating a ticket site, and you want to do customization, here’s a great solution. My Name is Brett Goldberg and I am the founder of TickPick, a new bid-ask ticket marketplace. Although I bought and sold tickets in the past, I am by no means a ticket broker and won’t tell ticket brokers how to run their business. However, I will make suggestions and provide feedback on the software which is available for ticket brokers, which I believe will help the largest ticket brokers and the smallest ones. If you want to chat, give us a call at 845-538-4567, anyone can help and will provide honest feedback, but if you want, feel free to ask for me, or email me at brett at tickpick dot com.